I know, I know. It’s tough to return to work after a nice long Memorial Day weekend… but perhaps a new mattress giveaway will cheer you up? How about if we add a cozy new sheet set to the deal? Now we’re talkin’! 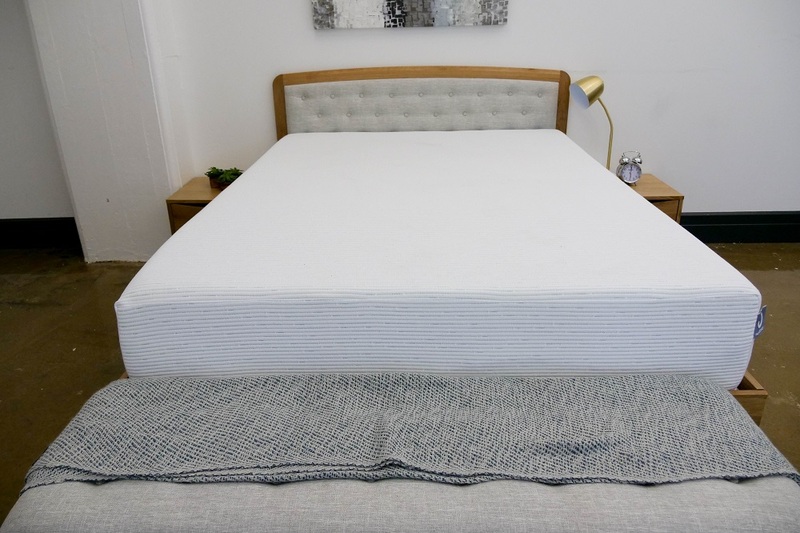 We here at Sleepopolis recently reviewed the Molecule mattress and are now happy to offer you a chance to win a new mattress and set of sheets from Molecule — winner chooses the size! Summer is right around the corner, so preparing yourself with a mattress that focuses on breathability might not be a bad idea. Not to mention, the cover fabric of the Molecule mattress bears special moisture-wicking properties to help keep you cool and dry while you sleep. This way, you can enjoy all the sweaty fun of hot summer days, but have a nice cool place to rest when the sun goes down. Speaking of sweaty fun, did you know this mattress was designed with athletes in mind? Its gentle all-foam design provides sleepers who are very active during the day with that extra pressure relief at night. Good thinkin’, huh? This mattress also comes with a brand new sheet set (you pick the size, of course) so your bed is nap-ready as soon as your goodies arrive. So what do you say — ready to test your luck? Enter now for a chance to win (and then read the full written review to get extra stoked)! Good luck, sleepers! I get super hot at night, the Molecule mattress sounds perfect! This sounds like an awesome mattress; would love to give it a try. I think the Molecule mattress looks very nice! It sounds great. I like that it is designed to provide a soft, cool sleep. It sounds like it is a luxurious quality mattress. I think the Molecule mattress is amazing. It really is just what I need. I love that it can help keep you cool! I wake up hot and sweating every night and it is miserable! Thanks for sharing the awesome review. I am so looking forward to that good night sleep, and it is a matter of within the year. I’m a side sleeper so I think this mattress would be perfect for me. I’m so excited for this giveaway! I’ve had non-stop back pain since I’ve bought my current “memory foam” mattress. This seems like such good quality & looks sooo comfy! It seems like a good comfortable mattress. Plus, it is cooling and breathable. a nice new comfortable mattress would be an amazing prize to win! Thank you for the chance to win. Recent back surgery ~ looks as though this would be the perfect mattress! I like that the Molecule mattress has a cover fabric that helps keep you cool and dry while you sleep. I always get too hot when I sleep so this mattress would help with that. I think this mattress is great for couples that sleep in two different positions. Sounds like a revolutionary mattress. Would love to have one! I need a new mattress so badly and this one looks so comfortable. Every time I have the money saved up something else breaks down and my back and sleep are paying for it. Thank you for the chance to win and have a good nights rest again. The Molecule Mattress is nothing short of a rluxurious, restful and dreamful nights sleep. The mattress is designed for you to have the best sleep, and I absolutely believe it. I love that its made of quality, green/eco friendly materials, it will keep you cool, as well as very comfortable all night. As a mother of 4, I know this bed would have me feeling like pampered royalty every morning! If I had the wonderful opportunity to win this, my house would be transformed into a Snow White Disney film, because that’s the power of an amazing mattress. Thank you! Looks great ! Need it bad ! I really hope that I win! I really could use a new mattress! What a wonderful win ! My set is over 10 years old. Congrats to the winner. This sounds like an interesting bed since I’m a side sleeper. Not sure about the sinking in feeling though. I’d love a chance to try it. Thanks. I want one king size.I am in need of it bad. The Molecule Mattress looks like a great option for side sleepers. It would be perfect for my dad, who had both of his hips replaced in 2011 and needs plenty of cushioning and support for sleeping on his side. I think the Molecule mattress looks amazing! Thank you for this chance a this wonderful prize. Looks Very Comfortable! Would be Nice to Win!! I’m a side sleeper, thus, this meets my needs! Thanks for the comprehensive review! I think the Molecule mattress would be wonderful for me because I am a side sleeper and I wake up in so much pain from my old mattress. Mattress Looks Amazing Great Review! Thank you for the chance To win this.This would be amazing to win. Good luck to everyone! My wife and I are buying a condominium and REALLY could use a new bed. I think it looks & sounds like a great mattress. I like that it’s soft. Would love a new mattress for the guest room, this looks like an interesting one to check out! The Molecule Mattress sounds heavenly. I like the cooling feature because my mattress is so hot I have trouble sleeping. This is perfect!! I’m remodeling a bedroom and this is absolutely the mattress I would pick for this room! it has all the features, bells and whistles I’m looking for!! Thanks for the chance to win it!! We really need a new mattress. This one looks comfy! Great review. Thanks! I’m a side sleeper so this sounds like a good one for me and I’m in need of a new mattress! :) I also like that it has some breathability so it’ll help me stay cool when sleeping. Looks like a “dream” come true! This mattress looks so inviting! It has all the features made for support and comfort. I would wake up feeling very refreshed and ready for the day! This mattress looks so good, would be thrilled to win it ! I would feel so lucky to win this and so blessed to share the experience! The main feature that gets my attention about this mattress is the moisture wicking feature, and I love the construction. I am really hoping I can win this one! Your mattress looks very comfortable I can already see myself sleeping like a baby in it. I think the Molecule Mattress sounds amazing. I like that the Molecule Mattress has a lot of cooling and pressure relief properties and is build to help you achieve slow wave sleep. I had no idea that mattresses had advanced so much since I last purchased one and therefore was seeing their functions. This mattress sounds wonderful. The Molecule Mattress is exactly what I am looking for when it comes to a comfortable mattress that shapes my body with the perfect amount of firmness. I really do like this and am anxious to give it my all to try to win in this exciting giveaway. oh boy! a nice new bed! It would be wonderful to win! My bones are so old. Good luck to all because we all want to win this bed. This is amazing!! Thank you for the chance to win!! My grandson really could use this. This would be such the perfect mattress for him. His mattress his very old. It makes him hot and very uncomfortable. comes with free sheet set!! Count me in!! lol Really it sounds like an awesome mattress. I’m a side sleeper and this mattress sounds like a slice of heaven for me! This would be perfect in my constant battle with Fibromyalgia. Looking for the perfect mattress and this looks like the one! I’ll be sure to tell everyone about this! I think the Molecule mattress would be great for those with back or hip problems. This bed looks awesome! Must be nap time! Thanks for a awesome giveaway. Nice well informed review. I really want this mattress and sheets! Awesome set up! I’d love to try it. I would love to have this mattress, I don’t see well and maybe this would help me. This sounds like the perfect mattress to replace our nearly 20 year old one that has awful pressure points. My whole life I have suffered with sleep. I’ve never had a new bed so I can’t imagine what it would be line to sleep on a mares that actually doesn’t have springs poking me or wore out on all sides. Winning this bed would probably solve all my back and sleeping problems. I think it is a great well made product and it looks comfortable. Looking forward to a cool night’s sleep! Definitely would love a new mattress! It’s been almost a year since I’ve slept for 8 hours! This Molecule mattress looks & sounds soooooooo wonderful! Love the cooling technology! Thank you!!! Definitely in need of a new bed and this sounds divine! I love the cooling technology. Still needing a mattress for my son. This one looks great! As someone whom has a incurable Rare Diseases and spends LOTS of time in bed. I couldn’t think of a better mattress than the Molecule, that provides pressure relief. This mattress sounds amazing. I suffer from chronic back pain and our current mattress is almost 15 years old. Winning this would be an absolute blessing! It would change my quality of life drastically. My mattress is so old. I definitely need a new one. This mattress seems wonderful. Maybe my sleep problems would go away! Hope I win!! What a dream it would be to own such an amazing mattress!! wow. and pressure relief. These sweepstakes are so fun! I love that it offers extra pressure relief at night. This mattress sounds perfect. Pressure relief and cooling. Just what I need! my children need a better mattress. I would love to win. Looks like a fine quality constructed mattress, like the cooling tech and pressure relief. Thanks! Looks like enough room for twl people. Lets Party! awesome that it provides pressure relief. I need a good mattress. Woo! Love that you support athletes like Barclay from ANW! Cool and dry!!! My kind of sleeping. I like everything this mattress offers. I toss and turn all night and always wake up tired. This mattress sounds like the answer to my prayers!!!! I am a VERY poor sleeper. I am sweaty. I toss and turn and wake every hour. 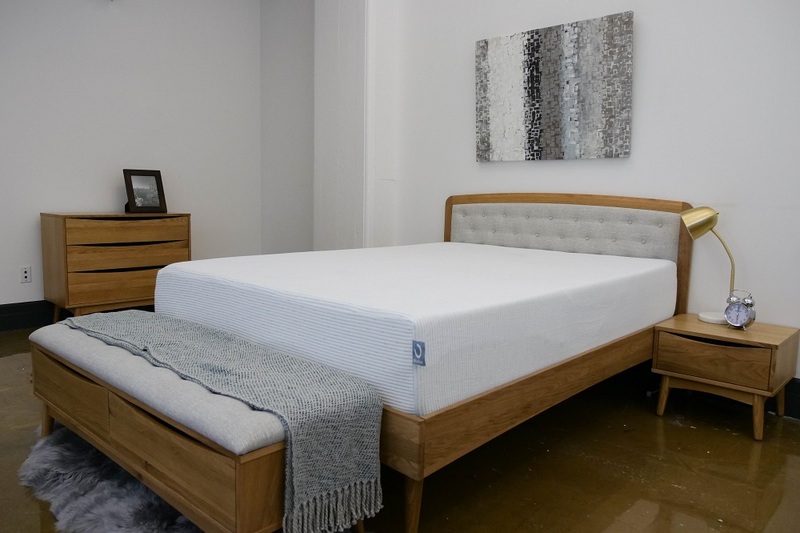 The Molecule Mattress claims it is built specifically conceived to help users achieve optimal “Slow Wave Sleep,” which some experts believe is the most revitalizing kind of slumber. Who doesn’t want that? It’s also cooling and It’s also breathable and soft, providing the sleeper with immediate comfort. It’s also a great mattress for side sleepers! A good mattress means a good night sleep and I so need a restful night sleep. Great for side sleepers…check. Cool top…check. Sinkage and lack of bounce is something to check on. I’m not even gonna say how old my current bed is – good luck 2 all!! The idea of a softer mattress appeals to me, but I wonder if a person’s back would be a little out of whack due to the hips sinking so much. You got me at the word “cool”…I would really like to have a nice cool night. Right now I have to have a fan at my bedside to be able to sleep. I soooo need a new mattress, currently doctoring on my sprained lower back from sleeping in current bed. This mattress looks amazing, I know it encourages nothing but sweet dreams! This mattress would help my Mom’s back so much. The chiropractor is getting rich off of her. Thank you for the opportunity! Sounds like I might actually get a real night of sleep with a mattress like this. This sounds amazing. I am a strict side sleeper and love good sinkage into a mattress. I also get a bit warm so the cooling would be great! This would be absolutely amazing to sleep on. I have trouble sleeping all the time. I hope if I win this mattress I’ll find my relief! Lov to try your brand. I like the 3 layers that it provides, each with its own specific benefit. Sounds like a great way to get a good night’s sleep! I think it sounds very nice! Each of the 3 layers described in the review has some benefit to getting a good night’s sleep and when added together, definitely assure one will be rested in the morning. This sounds lile a great mattress to get quality sleep using. I have issues with my back & chronic pain from fibromyalgia. I often avoid sleeping in my bed due to how uncomfortable it is and my inability to get comfortable. I dream of one peaceful night’s sleep on a perfect mattress. I’d love to win a Sleepopolis mattress. Swoon! This looks like a wonderful bed! Thanks for the opportunity to possibly win! Need a new mattress so love the opportunity to win one! Looks comfy enough. As long as I can get a good nights sleep it will work for me. I love the knit cover of this mattress. I can surely sleep on it right now and it would be great to own. Thank you for making many peoples lives change and come true. You are doing a great thing for so many people and providing better lives to everyone reading about mattresses and helping them chose quality sleep. Thank you for this chance! Good luck to all! I am ready for a good night sleep! I want to win this for my 92 yr. old mama. She’s on a very old mattress and has a lot of trouble sleeping. With this perfect for side sleepers and not having that bounce and giving you that sinking in feeling that she loves, this would be perfect for her. Look Super Firm and Comfortable. Probably too soft for me. This mattress sounds heavenly! I really need the pressure relief. I have many chronic illnesses, one terminal, and my pressure points hurt so badly causing disruption in my sleep. Thank you so much for this chance! Would love to win a new mattress. Mine is sooooo old. I think it sounds amazing! Would be a blessing to win! The cooling and pressure relief properties sound like just what I need. Thank you for the opportunity to win! I would really love this mattress. The comfort, cooling and pressure relief is just what I truly need. There seems to be quite a bit of sinkage to this mattress and it would have been nice to know how it typically performs on slatted platform beds. That much sink with slight pressure could worry someone that the bottom of the mattress could get ruined. Either way, though, pretty solid review. The mattress definitely seems like it would be worth it on the comfort scale as sooooo many foam mattresses and even hybrid mattresses sleep so firm. I would love to try out this mattress. I THINK I WOULD LOVE TO BE AN OWNER. It looks like just what I need! The Molecule mattress sounds perfect for a good night’s sleep. I would love to try this mattress. After 3 spinal surgeries, I do not sleep well. Thank you for the chance to win. The Yaasa Adjustable Bed looks affordable and amazing! This mattress looks perfect for me! As a side sleeper, I love sinking into a soft cuddly mattress. Thanks for the demonstration using weights, that was very helpful. This mattress would be perfect for my husband and I. Our mattress is too small, a full size, and having a queen size would be great. I love this bed! It seems to be very comfortable and soft. I like something that doesn’t make me hot while I sleep. Wow another great mattress that would solve a lot of my pain problems. Good luck and thank you Sleepopolis for all the reviews you do. This is so amazing! I would love to win this! I really like the moisture wicking properties of the Molecule mattress because I tend to go hot and cold during sleep. This comment is about the Molecule mattress (even though the entry field said comment about Yaasa adjustable). You say it would be good for side sleepers, but it seems too soft for me. I like a Medium firmness but don’t really like to “sink in” to a mattress. Cool name. Not sure how I feel about the soft memory foam top though. I tend to prefer the harder surfaces. I think this would be a great mattress to sleep on. I would love to try it! I really need this one for my mom !!! would love to win one of these great beds.am disabled and back is a mess==think i would sleep better on one of these beds. let me know when there is a contest. I am totally impressed with this item. Coming from a manufacturing and machine design background I can tell you that the frame is of a solid construction. I have built race cars, utility trailers, and automation machine bases. This unit is well built! The motors are quiet and the control is simple to use. This is a winner! The Yaasa Adjustable bed would be perfect for my guest room as I have visitors year round that vary in height and this would be a good fit, no pun intended. What a wonderful mattress ! This mattress sounds wonderful! Exactly what I need because I get so hot at night! Love the idea of added pressure relief! I’m revamping my entire bedroom to enhance my sleep. I even luxed out on linen sheets. I’ve got the lighting right, removed the tv and now am deciding on the perfect bed. Adjustable beds have never been a favorite of mine. Even the pictures do not look appealing. As a result, nor do i have a particular fondness for The Yassau Adjustable. I’m shopping around for a new mattress (for when I have the cash, ha), and the Molecule is going on my shortlist of contenders! The photo in your review of you sinking in side lying looks divine. The more I read your reviews, the more I want to break up with my chunk of memory foam from Sam’s Club. Great review – thanks. However, I have a Dilemma. I sleep an equal amount of time on my back and side, and I like a little bounce. I prefer a soft mattress. What mattress would you recommend for me? My wife and I are very active and athletic and it has been very hard to find to the right kind of mattress. As a side sleeper who likes a cooler sleeping environment, this mattress warrants consideration. And the relief it provides for shoulder and hips is what I am looking for. I have never heard of the Molecule mattress before, but it looks amazing! Fingers crossed, would love to win! The bed look so comfy! I would love to have a bed like this! Sure do need this.Senior on very fixed income ! Would LOVE to experience this product!!!! Sounds interesting, I like the idea of cooling but tend to like a more firm mattress. I could really use one ! I love that the bed is adjustable, would help with my wonderful Husband’s snoring. I am not to sure but I really need a new bed ! Thanks for the chance to win! I have not had a new bed in over 15 yrs. I’d love a new mattress then my back wouldn’t hurt so much every morning. so many wonderful naps to come! I like the yassa and the molecule. Another awesome giveaway.I need a mattress that breathes,maybe it will help me sleep with these hot flashes. I love to win a lovely, restful nights sleep. Please draw my name. I need sheets and mattress. Ready for a good night’s sleep. Been decades since that’s happened…seriously! Thanks for the giveaway opportunity! Looks like such a comfy mattress. Love this sites reviews! Hard to buy a mattress online not knowing how it feels, this site really helps to inform the consumer!!! I need a queen size. I would love a new bed. I love how this fits the needs of someone disabled. The fact that it’s a life time warranty it awesome. I think it is Great! Just what I need! This bed looks like heaven. As a strict size sleeper from serious back injury who also sleeps extremely hot, I would LOVE to see how this mattress feels! Really love a soft bed that I sink into so it seems to check all boxes for me. That is one good-looking mattress. I would love to try it. Thank you for the change to win . I’m having to replace all of my mattresses and upholstery, plus I’m tired of my rock hard mattress anyways! This mattress sounds delightful! I love everything about the Yaasa adjustable bed… well, maybe except for the amount of assembly. It sounds absolutely terrific. Looks amazing! Just what I need for summer. This is such a good read. This Mattress looks amazing and so comfortable love everything about this mattress I am a side sleeper so I know this mattress would be so good for me!! I Would Love to Win this!!!!!!!!! Such an amazing giveaway !! The yaasa adjustable bed would be lovely, this molecule mattress has my name all over it! Never won anything since I was 14. I won a boombox at a raffle drawing at an auction my dad took me to. I sure could use a fine mattress like this. It would help my bad hips and back. Was in an car accident and it’s not going to get better only worst. bed looks wonderful I really need a new bed that would be great excited. I really like that this mattress offers extra pressure relief at night as I toss and turn constantly.